The People's Guide 2015 2 Introduction . 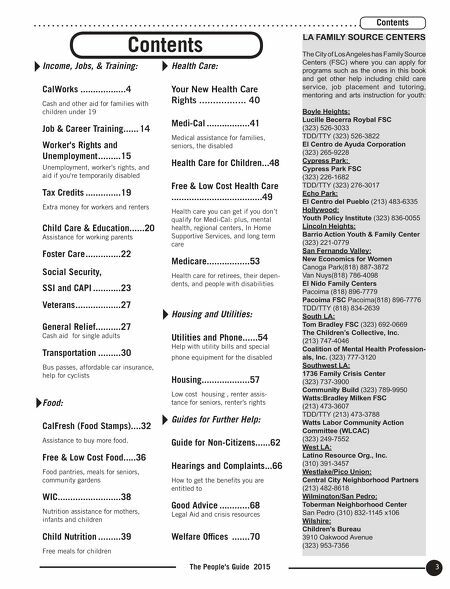 Introduction The People's Guide gives practical infor- mation about how to get food, money, housing, health care and other help from government programs and community services if you live in Los Angeles County and need help in hard times. You do not have to read the entire book, just find the topic you need in the table of contents. However, people who are eligible for one kind of help often qualify for other programs as well, so read the entire booklet. The People's Guide also gives advice on what to do if you are treated unfairly or do not receive what you are entitled to by law. Lately, massive government budget cuts have meant less help for low in- come families, seniors, and homeless people: fewer workers at agencies, clin- ics and hospitals closing, tighter rules for getting help, reduced benefits, as well as waiting lists for many programs. There are other problems with obtaining assistance: rumors and false informa- tion that discourage eligible people from even trying to get help their family desperately needs, people not knowing what the application steps are, language barriers, people being made to feel em- barrassed for asking for needed help. The People's Guide is dedicated to help- ing all people overcome barriers when they try to get help. Every person has the right to enough food, housing, and health care. You help when you share this information with other people who need help. There is another important way to help. In Sacramento, Washington DC and in County and local governments, the programs and services described in the People's Guide are always being debated. There is a huge conflict about the money for these services. Your voices are needed in those debates. Tell politicians how the programs help or don't help and what your prob- lems are. Government officials need to be reminded of the tragic crises and pain that happen in people's lives when they can't get food, housing, or health care. To get names and addresses of your lo- cal, state and federal lawmakers: call (800) 481-8683- County Registrar. or visit: www.lavote.net Politicians often want to use money for other things than health, welfare and social ser- vices. But when the rich get too much richer and the poor get too much poorer, the gap has very bad effects on the whole society. You can help close that gap. You don't have to be an expert. Simply let those in authority know how a budget cut affects you or your neighbors. Hunger Action Los Angeles and our mem- bers struggle for policies that save and improve the safety net. Hunger Action Los Angeles (HALA) 961 S. Mariposa Los Angeles, CA 90006 Tel: 213-388 8228 www.hungeractionla.org For more information on getting help: 211 LA County On the internet: www.211la.org 211 is a 24 hour per day, 7 day a week telephone information and referral ser- vice. Operators are available in many languages. They can help you find emergency food and shelter, legal and financial assistance, counseling and many other resources. Phone: 211 or (800) 339-6996 (800) 660-4026 (TTY) Healthy City California's information and action resource for service referrals and social change. Visit them at http://www.healthycity.org Public Policy Organizations You can call these groups or attend their meetings to learn about policies affecting you. Bus Riders Union (213) 387-2800 California Food Policy Advocates (213) 482-8200 California Partnership (213) 385-8010 Coalition for Humane Immigrant Rights of Los Angeles (213)353-1333. Community Coalition (323) 750-9087 Community Health Councils (323) 295-9372 L.A. Alliance for a New Economy (213) 977-9400 L.A. Community Action Network (213) 228-0024 Legal Aid Foundation of Los Angeles (800) 399-4LAW Maternal & Child Health Access (213) 749-4261 Neighborhood Legal Services of Los Angeles (800) 433-6251. 35th Edition. The People's Guide to Welfare, Health & Other Services ©2014-2015 Hunger Action Los Ange- les (HALA) Editors: Frank Tamborello, Michelle Udeorji Editorial Committee and Major Contributors: Elena Ackel, Yolanda An- guiano, Yolanda Arias, Nancy Berlin, Ryan Bradley, Andrew Chen, Hannah Courtney, Cathy Deppe, Lilya Dishchyan, Nikki Edwards, Ben Gordon, Lynn Kersey, Jin Lee, Caitlin Lynch, Kate Meiss, Jeanne Nishimoto, Donald Noller, Lucy Petrow, Natasha Roland, Matt Sharp, Marjorie Shelvy, Leepi Shimkhada,Jose Tello, Staff of LA County DPSS, Staff of LA CAN. Ap- pologies if we missed anyone. 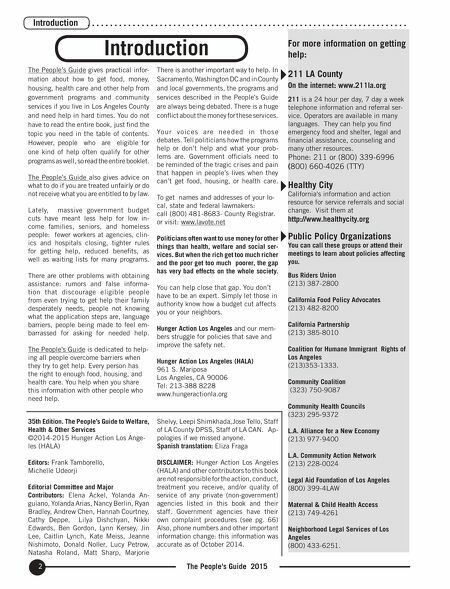 Spanish translation: Eliza Fraga DISCLAIMER: Hunger Action Los Angeles (HALA) and other contributors to this book are not responsible for the action, conduct, treatment you receive, and/or quality of service of any private (non-government) agencies listed in this book and their staff. Government agencies have their own complaint procedures (see pg. 66) Also, phone numbers and other important information change: this information was accurate as of October 2014.